This is one of those things that seems so challenging but is actually very simple. Most sophisticated things in life are very basic when you really think about it. Like red wine, caviar and mustaches. It's just grapes, eggs and hair. 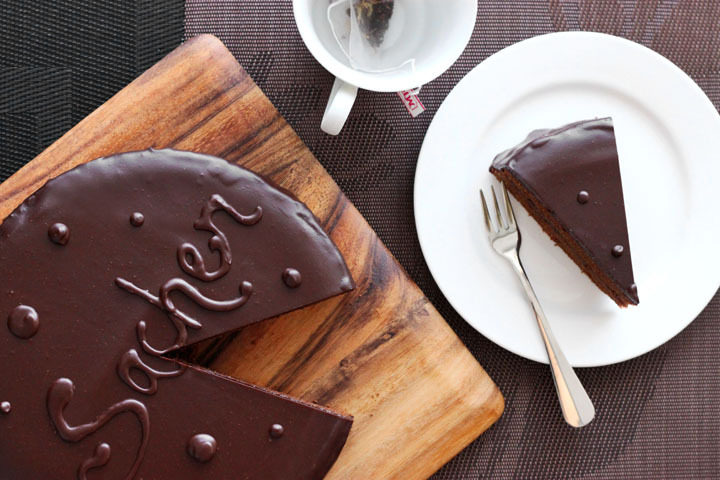 This classic Viennese cake can be found behind glass cabinets in pastry shops all around Europe. It is nothing more than a nut-based chocolate sponge sandwiching a layer of fruit jam and glazed with chocolate. Tradition calls for apricot jam but I have used raspberry jam as I feel the combo of raspberry in chocolate is a sure winner. The cake base is a cross between a butter cake and a sponge cake. It starts off with creaming butter and sugar until really light and pale, but then only the egg yolks are beaten in before beaten egg whites are folded into the mixture. These whipped egg whites are the only leavening for this cake so take care at this stage. 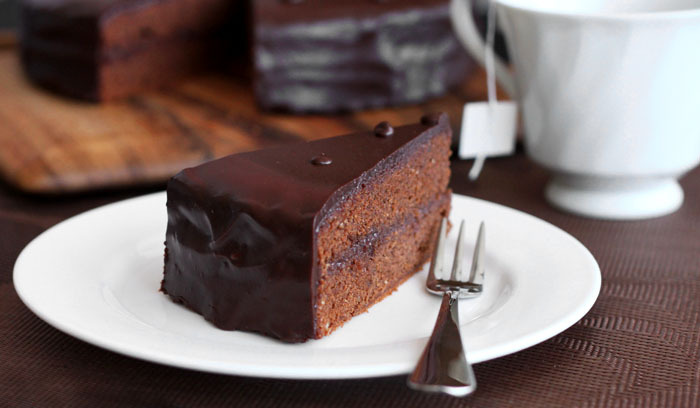 The result is a moist and seemingly dense cake with a surprisingly light texture. 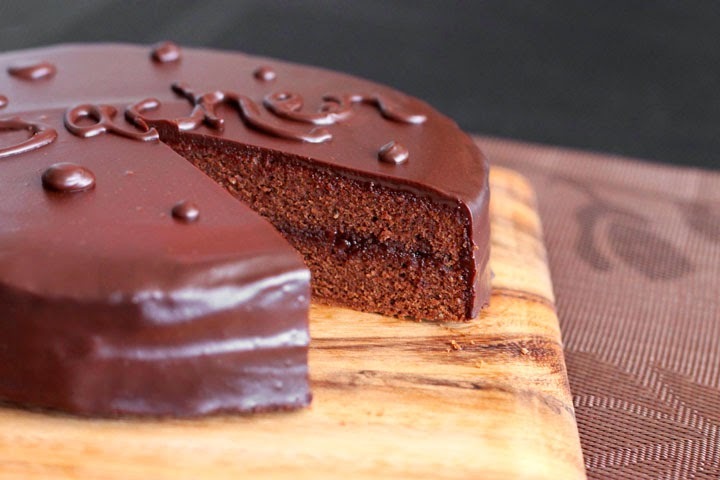 You can use chocolate ganache for the glaze if you already have some on hand or need to use up some cream, but I prefer a water-based glaze because it sets up really shiny and silky smooth. Water + chocolate - that's right! No way Jose? But I say yes way! The story about water and chocolate not mixing well isn't entirely true. It depends on the ratio of water to chocolate. A tiny bit of water will spoil your batch of melted chocolate, but enough of the clear stuff will bring it to a smooth silky sauce. The fat particles need a large enough medium to suspend themselves in. The same can be said for the cocoa solids. The trick to getting a smooth professional finish on the cake is to spread as little as possible. You need to have plenty of the glaze and just pour it over to cover. That's what the wire rack is for - the wax paper or tray beneath it will catch the drippings so you can scrape them up. Waste not, want not. Feel free to double the glaze recipe and keep leftovers in a sealed jar in the fridge as ice cream sauce! I highly recommend a pinch of salt if you choose to. Now go ahead and impress. Perhaps grow a mustache and serve with a side of caviar too. Preheat the oven to 350 degrees F. Grease a deep 8-inch round cake pan then line the base with parchment paper. First melt chocolate gently in a bowl set over a pan of hot water, stirring occasionally, then cool slightly. In a medium bowl, sift together flour, ground almonds and salt; set aside. In a large mixing bowl, beat the butter, 2/3 cup of sugar and vanilla until very light and fluffy. Beat in egg yolks one at a time until well combined. Add the cooled chocolate and stir to blend. Fold in the flour mixture. The mixture will be quite thick at this stage. In a separate bowl, whisk the egg whites until foamy and gradually beat in remaining 2 tablespoons of sugar. Beat until soft peaks form. Add about one-third to the chocolate mixture and stir in vigorously. Gently fold in the remaining egg whites in two parts. Pour the mixture into the prepared pan and level the surface. Bake for 35-40 minutes, or until puffed, slightly cracked and feels firm to the touch. Transfer pan to a wire rack and let cool for 10 minutes before turning out onto the rack to cool completely. To make the glaze, bring water and butter to a simmer in a saucepan over medium heat. Remove from heat and add chocolate. Let stand a few minutes and then gradually whisk until very smooth. Refrigerate until thickened but still pourable, stirring every few minutes. Meanwhile, slice the cooled cake in half horizontally. Spread raspberry jam over the bottom half and replace the top half. Place the cake onto a wire rack with a large baking tray or piece of wax paper beneath it. Spoon a couple tablespoons of icing into a small paper icing bag or ziptop bag for decoration and set aside. Then pour most of the glaze on to the center of the cake. Spread it just barely to coax it to the edges and let it run down the sides. Repeat with the remaining glaze and leave to set. Snip off the corner of the filled icing bag and pipe ‘Sacher’ across the top and leave to set. Chocolate + raspberries! So delicious!